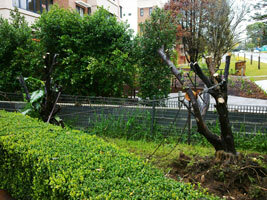 Sydney Tree Removals offers a wide range of tree services in the Northern Beaches. We have a team full of professional arborists, we can confidently tackle any job proficiently and effectively. All our staff are trained for their job specific functions, including our tree climbers having a minimum of a Certificate III in Arboriculture. We are qualified arborists who work in the Northern Beaches using the latest techniques and equipment to ensure that your Northern Beaches tree and stump removal service is a success. We work confidently at any height, in confined spaces, near power lines, or over buildings and near structures. Our training enables us to lower branches over houses and pools in ways not to damage infrastructure. Our qualifications permit us to operate and use cherry pickers (boom lifts). When you need professional tree services for the Northern Beaches, you need Sydney Tree Removals. Sometimes clients in Cottage Point refer to our tree arborists as "tree doctors" or "tree surgeons". This recognition of skill is greatly appreciated by our arborists, because they love making hard work in the Cottage Point area look easy. We are one of the best tree cutting service in the Cottage Point area and throughout the Northern Beaches. Just ask our customers or read reviews of us online. Our customers are happy about our excellent service and professional conduct. We pride ourselves of being able to safely perform tree cutting for a reasonable tree cutting price. There are many tree removal companies in Northern Beaches that say they offer similar tree services, but they often lack experience, qualifications, insurance and expertise, and become a huge liability and risk. Don't risk it with any tree cutting company in your Northern Beaches area, call Sydney Tree Removals instead.